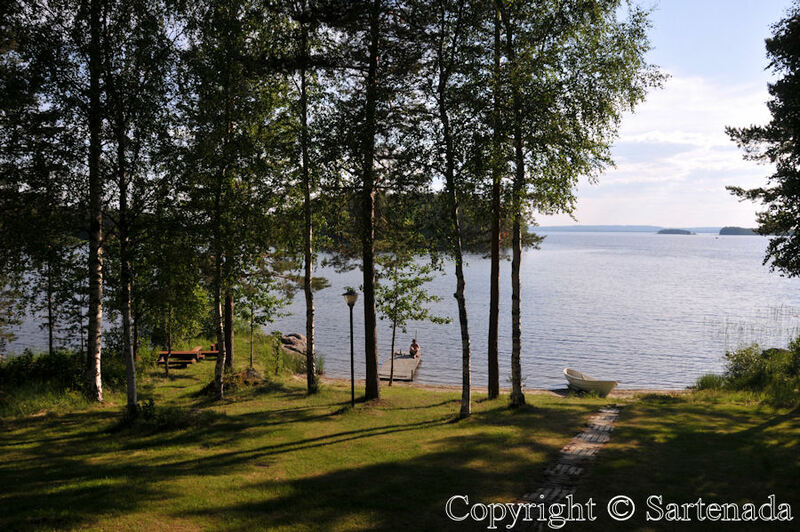 One week vacation on a hired cottage on Hattusaari. 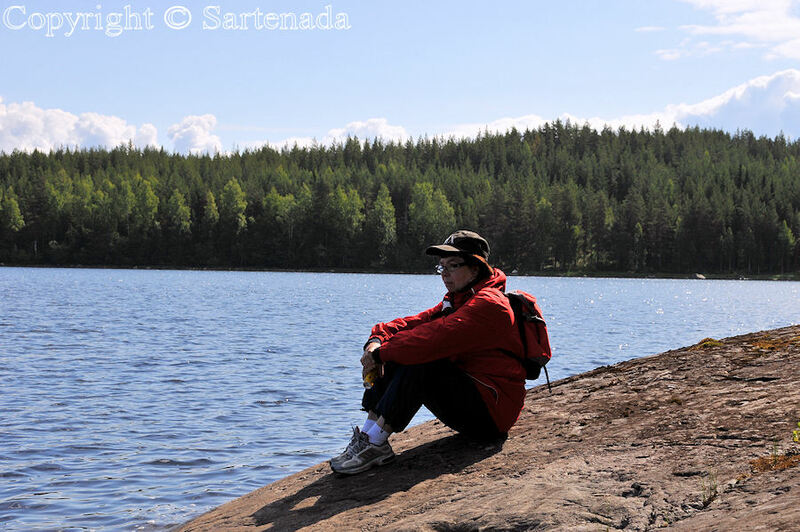 In July 2009 we spent a mini vacation of one week on the island of “Island of hat” in Finnish Hattusaari. 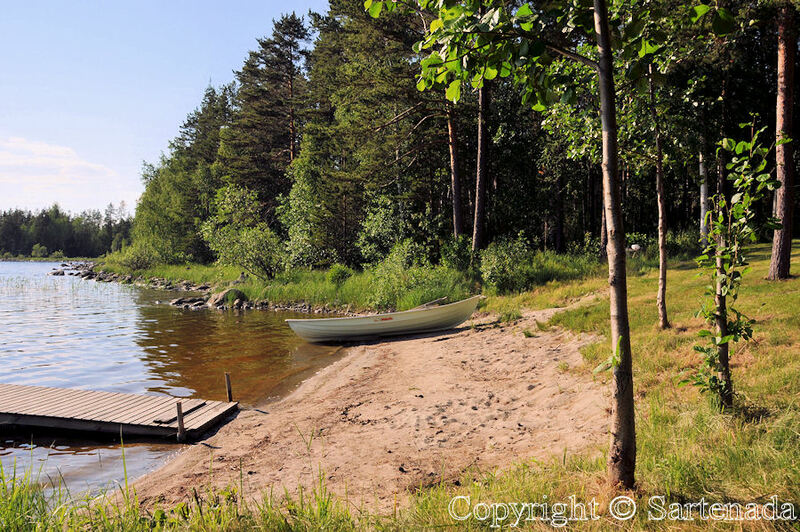 This island is situated from Helsinki about 500 kilometers / 310 miles. 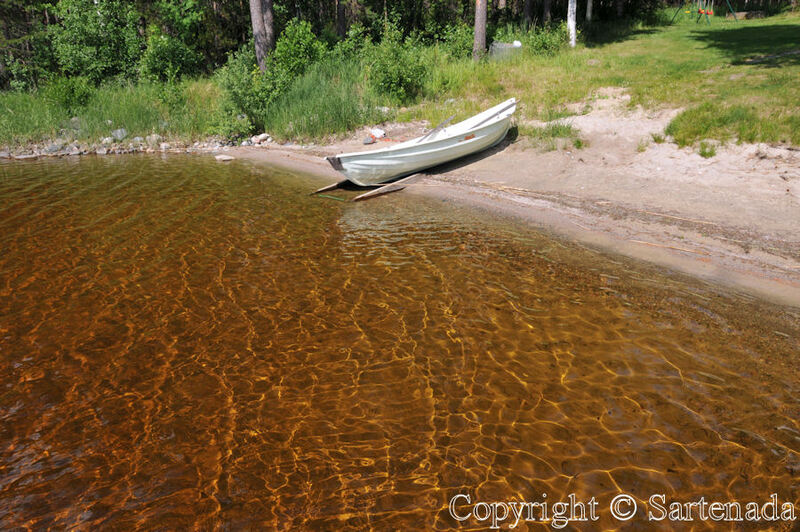 The island itself is on the huge lake of Pielinen which is connected by bridge to the mainland. 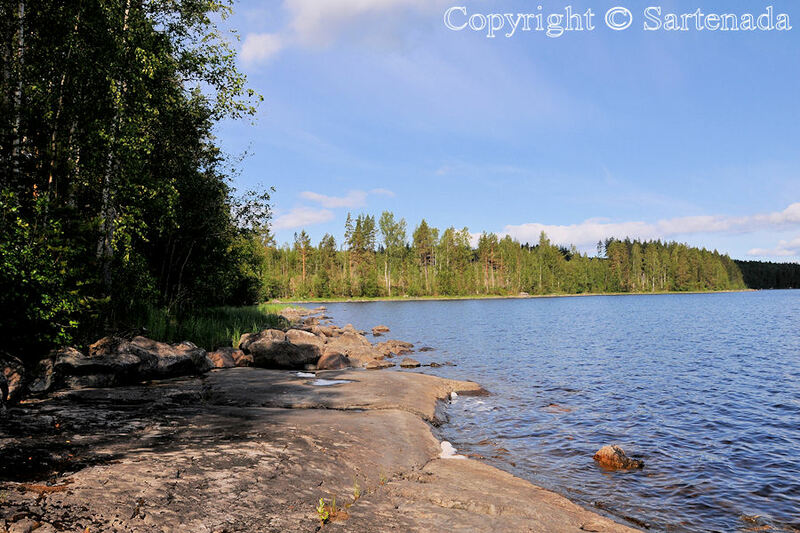 Lake Pielinen is quite big, because to drive around it takes about 5-6 hours. So the frames were good for our vacation. 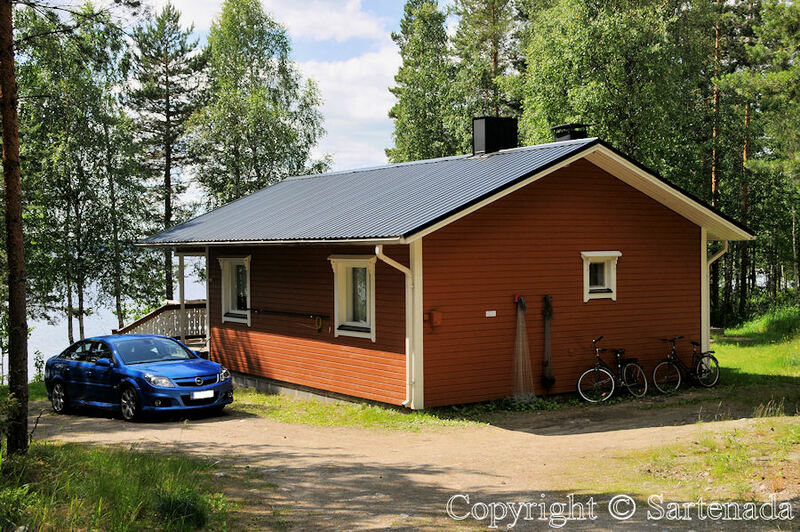 Our cottage was a very basic model and thereby the cheapest one. But does two adults so much luxury around them? We did not. 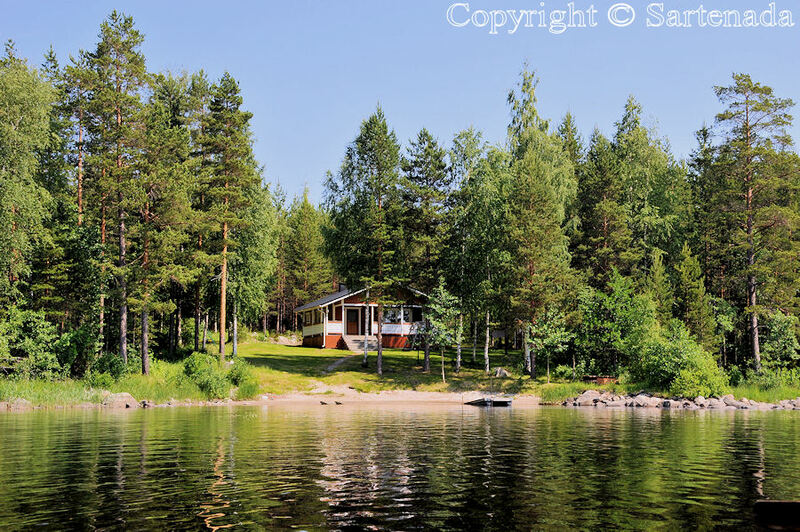 The cottage with terrace had everything one needs, like: Sauna, television, DVD, VCR, bedroom, living room with kitchen, fireplace, barbeque place, wooden garden swing for four, two bicycles, own beach with small pier and rowing boat. 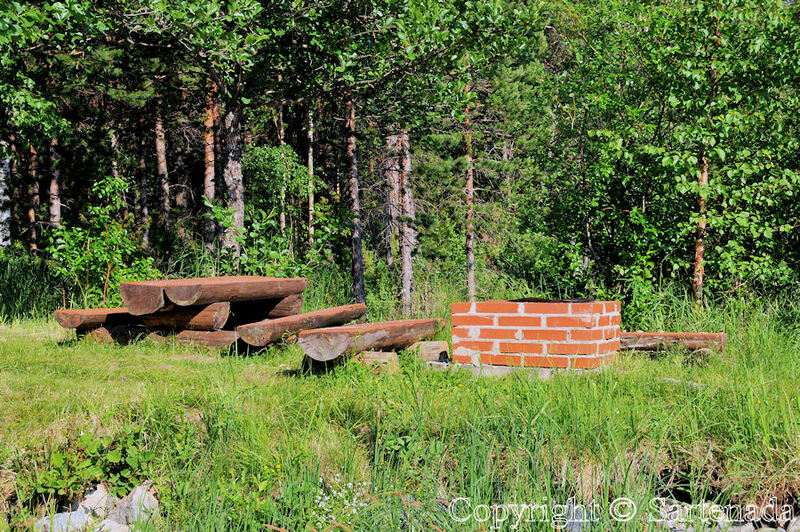 Of course there was a fish-trap with permission to use it. What more one need during vacation? What You see when looking at my photos? Well, plenty of photos from that lodge, pier, rowing boat, stones, reflections of clouds and reflections of afternoon sun rays in the water. 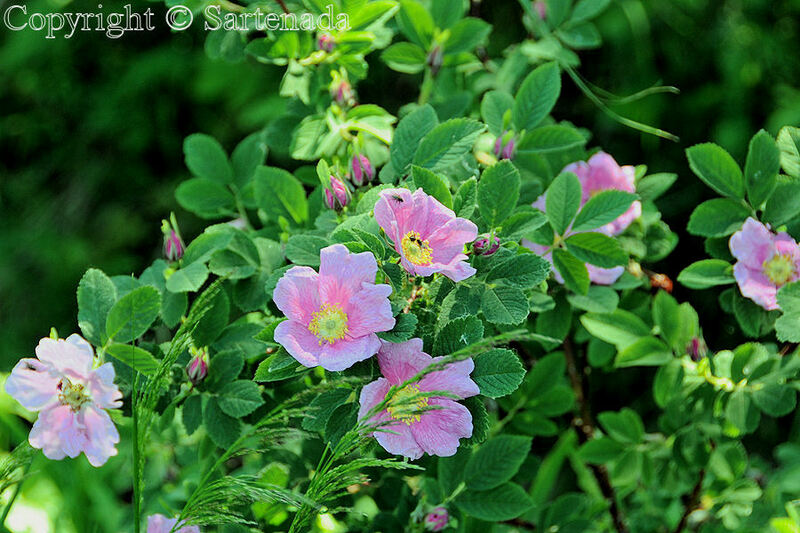 Also some flowers, “drag race of birds” some traditional “curiosities” like carved wooden bear. 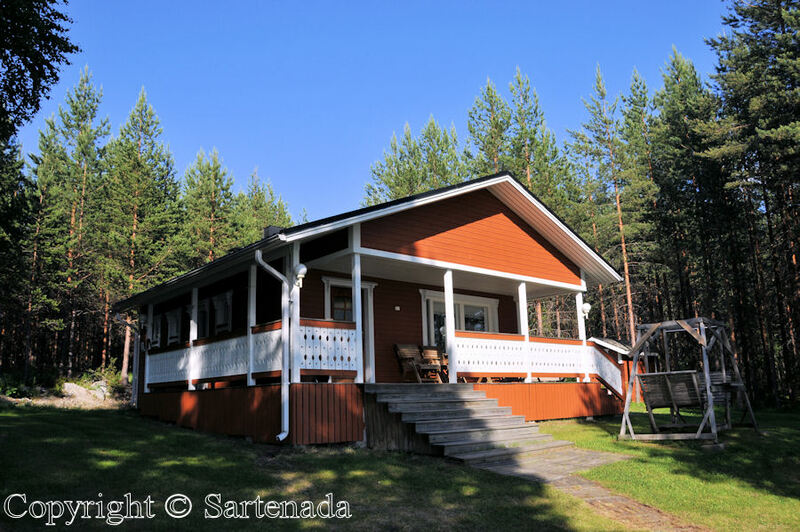 We enjoyed our vacation on this cottage and also we explored all the surroundings and sights. 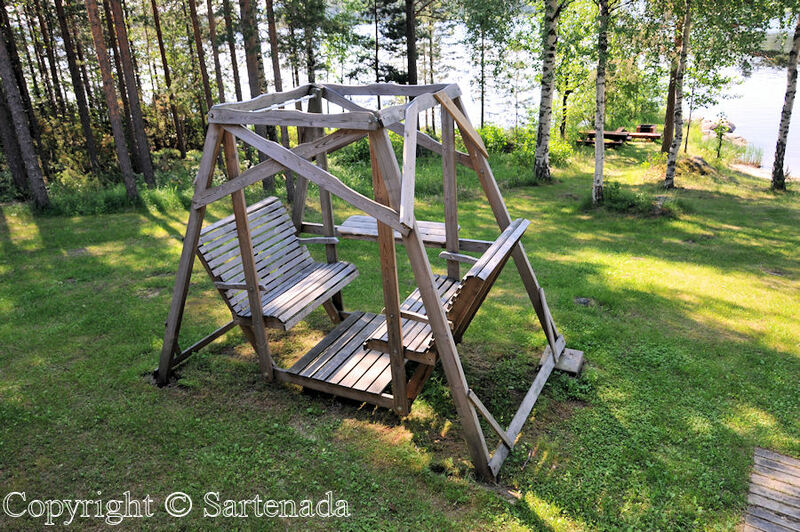 Vacaciones de una semana en una cabaña alquilada en Hattusaari. 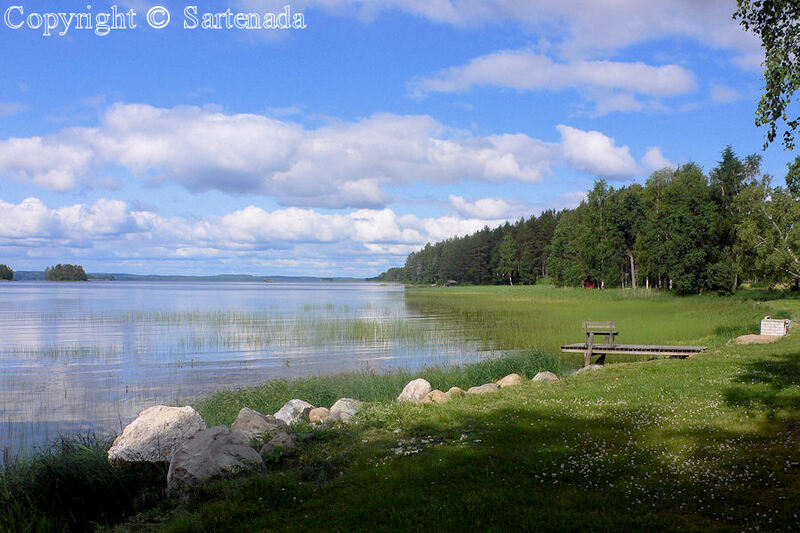 En julio 2009 pasamos nuestras pequeñas vacaciones de una semana en la isla de “Isla de sombrero” en finlandés Hattusaari. Esta isla está situada de Helsinki aproximadamente 500 kilómetros/310 millas. 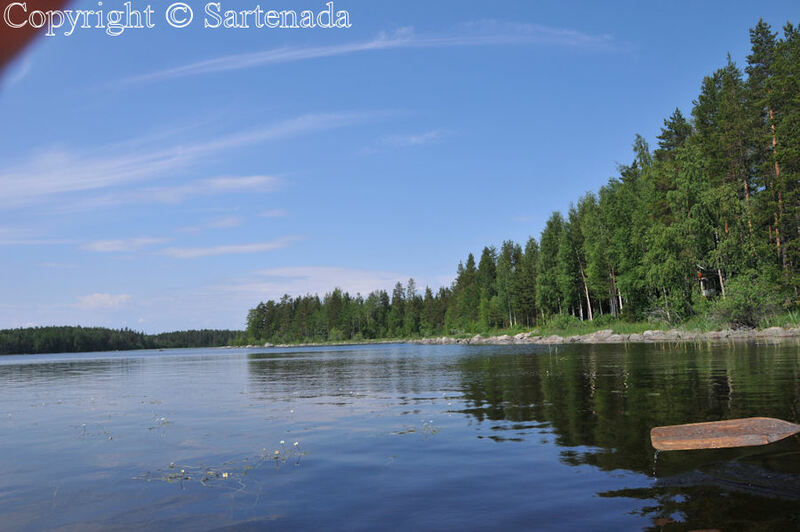 La isla misma está en el inmenso lago de Pielinen que es conectado por el puente al continente. 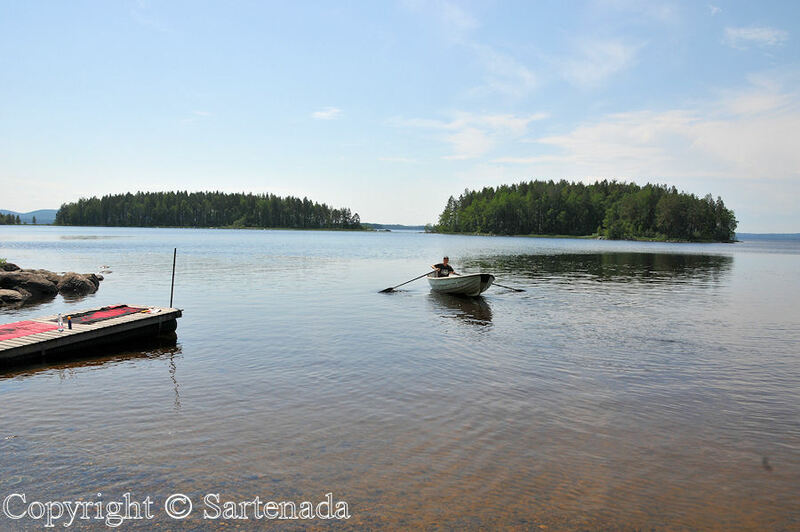 El lago Pielinen es bastante grande, porque al conducirlo alrededor, toma aproximadamente 5-6 horas. Así que los condiciónes fueron buenos para nuestras vacaciones. Nuestra cabaña fue un modelo muy básico y claro que muy barato. ¿Pero qué hace dos adultos con tanto lujo alrededor de ellos? Nosotros nada. La cabaña con terraza tuvo todo que uno necesita, como: sauna, televisión, DVD, video, dormitorio, sala con cocina, chimenea, lugar de barbacoa, palancín de madera para cuatro, dos bicicletas, playa con pequeño barco, muelle y bote de remos. Por supuesto había una trampade pez con permiso de utilizarlo. ¿Qué más uno necesita durante sus vacaciones? ¿Qué Usted ve al mirar mis fotos? Bien, muchas fotos de ese cabaña, muelle, bote de remos, piedras, reflejos de nubes y reflejos de rayos de sol de la tarde en el agua. También algunas flores, “concurso de pájaros” algunas “curiosidades” tradicionales como “oso de tallado madera. Disfrutamos de nuestras vacaciones en esta cabaña y también exploramos todos los alrededores y las vistas. 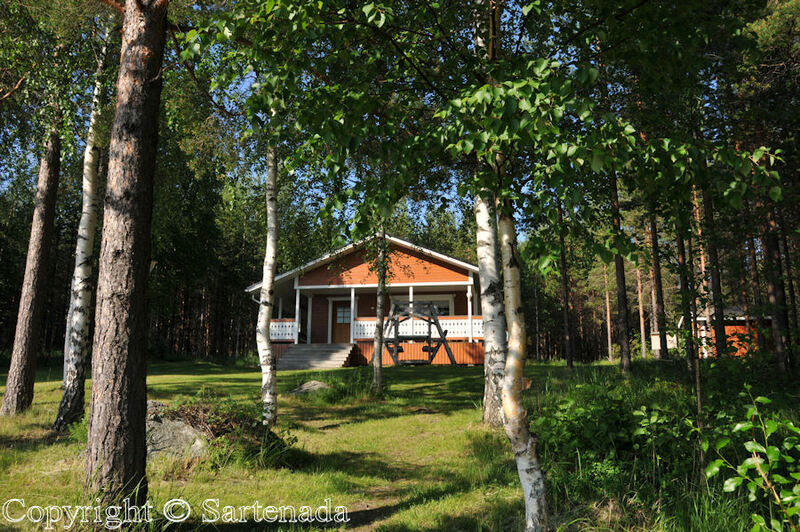 Vacances de une semaine dans une cabane louée sur Hattusaari. 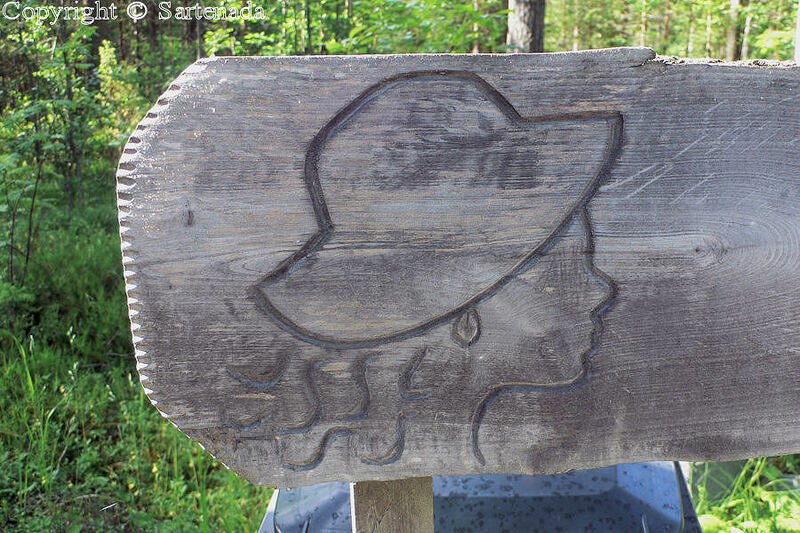 Au mois de juillet 2009 nous avons dépensé une mini-vacances d’une semaine sur l’île de “l’Ile de chapeau “ dans Hattusaari en finnois. Cette île est située de Helsinki à peu près 500 kilomètres/310 miles. 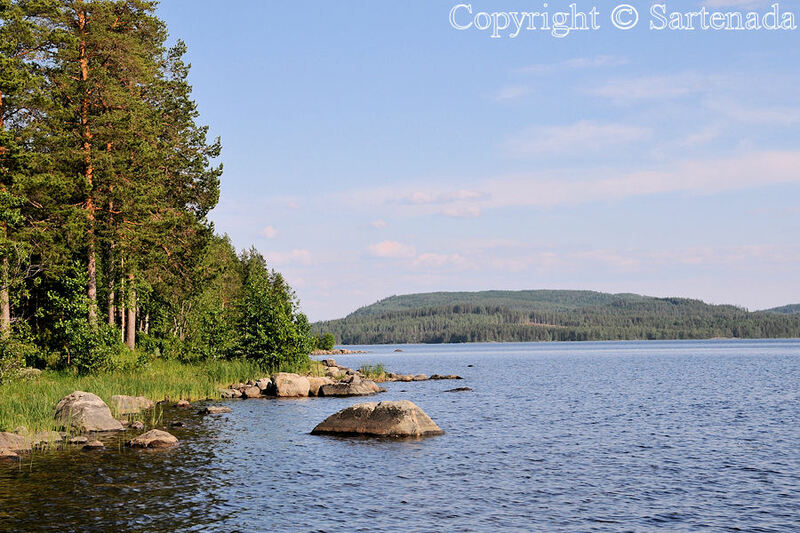 L’île que lui-même est sur le lac énorme de Pielinen qui est connecté par le pont au continent. 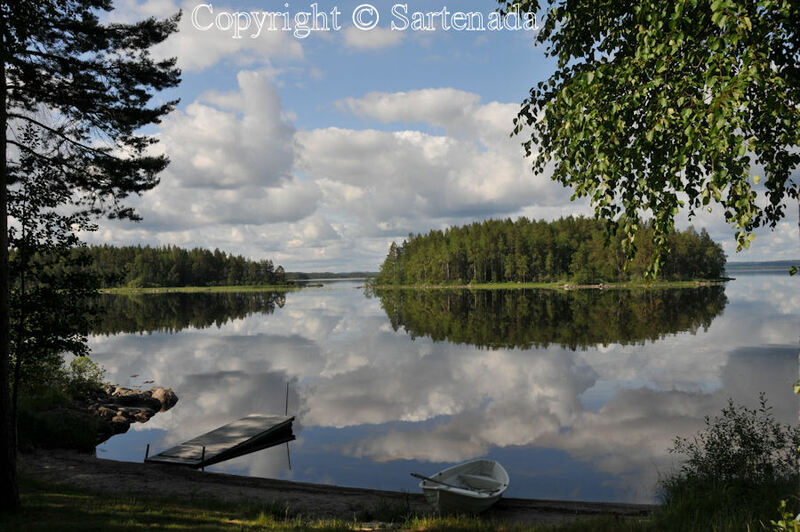 Lac de Pielinen est tout à fait grand, parce que en conduisent autour le, prend à peu près 5-6 heures. Donc les cadres étaient bons pour nos vacances. Notre cabane était un modèle très basique et de cette façon le plus bon marché. Mais que fait deux adultes autant de luxe autour d’eux ? Nous rien. La cabane avec la terrasse a eu, comme : sauna, télévision, DVD, magnétoscope, chambre à coucher, salon avec la cuisine, cheminée, lieu de barbecue, balançoire de jardin en bois pour quatre, deux vélos, plage avec un petit quai et bateau de canotage. Bien sûr il y avait une nasse avec la permission pour l’utiliser. Que plus on a besoin pendant les vacances? En regardent mes photos que Vous en trouvez? Bien, beaucoup de photos de cette chalet, ce quai, canot à rames, pierres, reflets de nuages et reflets de rayons de soleil dans l’eau. Aussi quelques fleurs, “ une concourse d’oiseaux quelques “ et curiosités” traditionnelles comme un ours en bois taillé. Nous avons apprécié nos vacances sur cette canane et aussi nous avons exploré tous les environs et les vues. I start my vacation on next Saturday and will be back about three weeks. Empiezo mis vacaciones el próximo sábado y estará de regreso en tres semanas aproximadamente. Je commence mes vacances samedi prochain et sera de retour dans trois semaines environ. 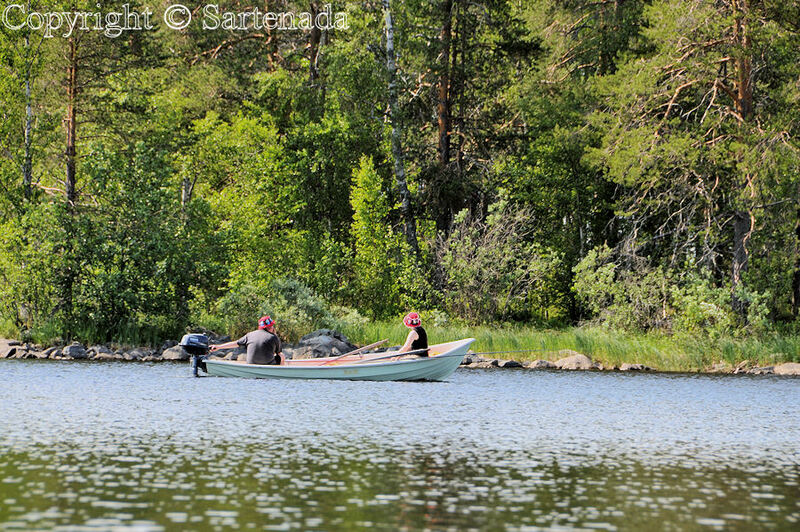 Oh my, you and your wife are so like us – holidays with walking, fishing and nature. But your cottage is not basic. In this part of Canada a ‘basic’ cottage would be a hut with a bed, sofa, cooker – no TV, VCR, and certainly no sauna. I would love a holiday on that island, but even looking at your photos take me there for a trip and tell me everything I want to know. Thank you so much for this visit. Have a great vacation and I look forward to your next Blog telling us all about it. So nice You liked my photos. I saved this post just before our vacation. We both are outdoor people who like to stroll around. Our vacation trip is going to Germany by car (hmm, again). To reach Germany we take our car by boat. Next Saturday we are onboard the ship and reaching Travemünde on Monday morning. From there by one overnight stop towards to Black Forrest. I do hope that there we find good paths to walk. Then to the North slowly checking place we have not visited earlier. Return trip is starting on 17th, Thursday from Travemünde also and at Helsinki on Saturday morning. I have promised to my wife to be off from Internet few days, because on holiday we have also a lot of things to do. Garden requires “helping hands”, although my son is visiting few times at our home. I’ll start my next post with presenting roses in our garden. So until that day. What a beautiful cabin and vacation spot! Hope you have a great time, I love the second-to-last picture. -j.p.
Because the lake is huge, then there is quite often wind. It was on one morning when there was no wind and those reflections of clouds were great. We enjoyed our morning coffee looking at calm water surface sitting on terrace and listened to the only “noise” which was birds’ song. That was memorable moment. Thank You leaving Your comment. I very much enjoyed the photos of the island. What a beautiful place to spend a week! 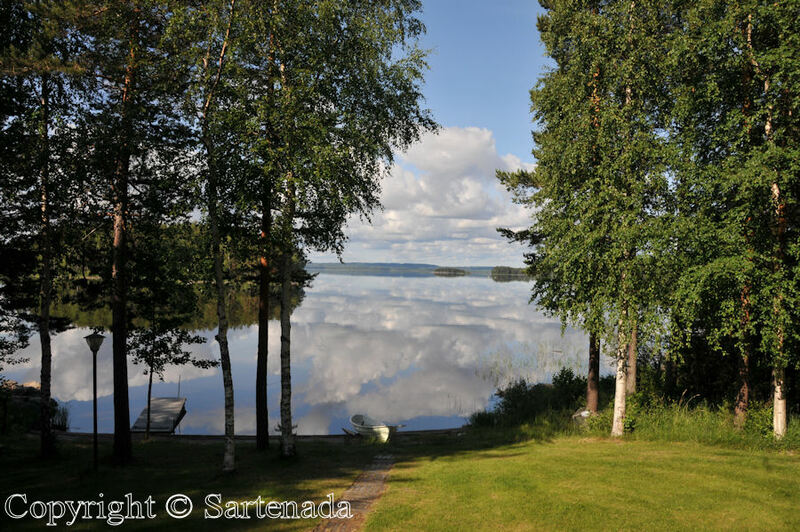 Those photos of the clouds reflected in the lake are simply magnificent! Yes, the place was ideal. 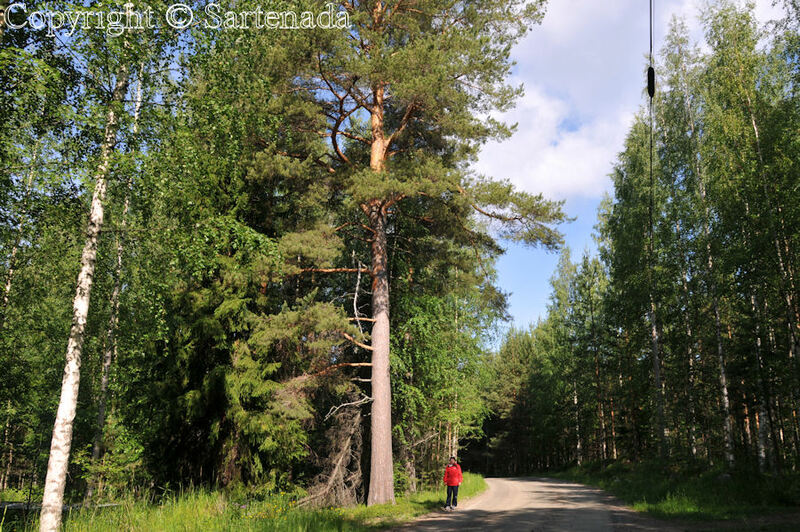 There was so much to see in neighborhood, for example one of our best National park called Koli. It was only at the distance of 10 kilometers / 6.2 miles. I have visited that place many times since my young hood. 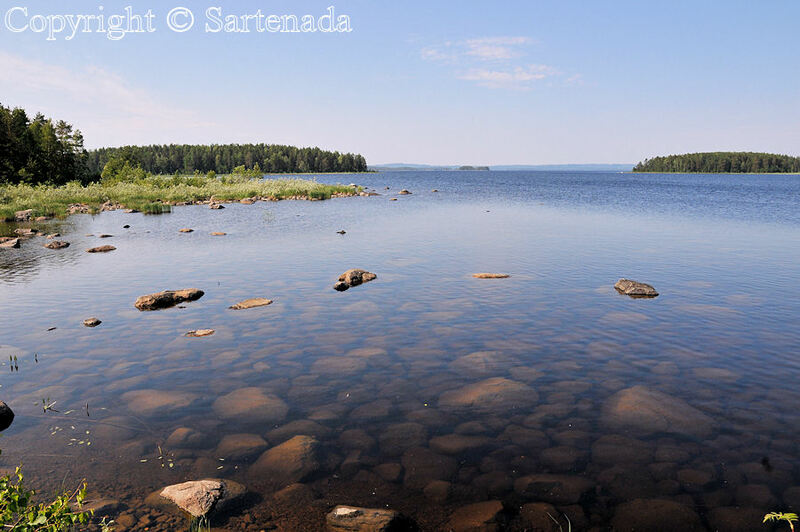 From the top of rock there is mighty view over the lake Pielinen with its islands which are all in same direction (North – South). The quartzite of rock of Koli is also very special, maybe in the whole world, but I am not sure. I guess that place would be to You nice place to examine what wonders “Mother Nature” is offering. of this landscape, I am very excited. Nature is in color, beautifully reproduced in your images. This place exudes a lot of harmony and peace and the feeling on the spot to be there. It looks like freedom and adventure. No industry, no noise of cars driving on the highway, no noise of planes flying over every day, so I think it is very quiet. There you can very well relax a few days or weeks and listen to the song of birds. 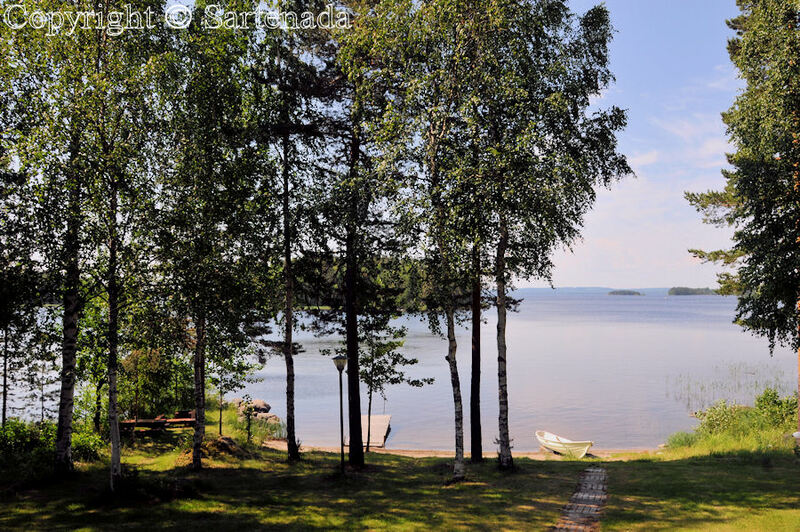 The view of the lake, seen from the house is a dream. The flowers you gave also fantastic reflected in your images. Even the flies or insects I could see. The last 6 pictures, from bottom to top are my favorites. Figures 5 and 6, from bottom to top acts, water reflection, color, like amber. 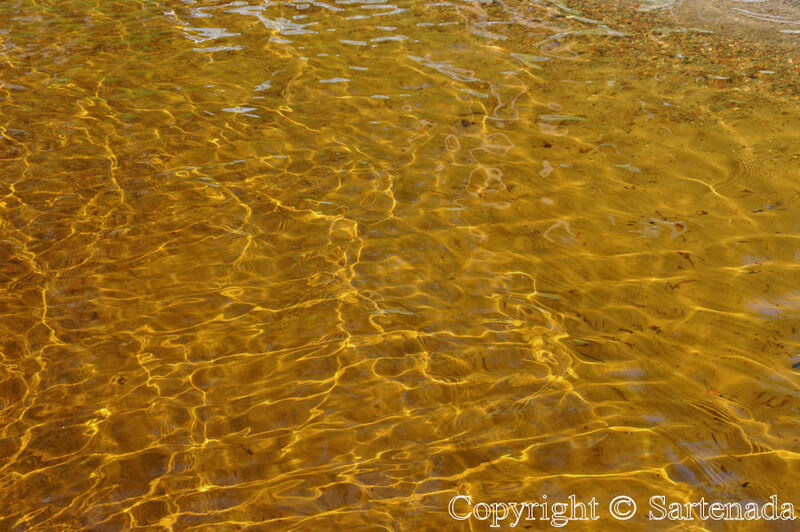 The beautiful water reflections are more than fantastic in the reproduction of your images. The following pictures I had to look very closely to see what is up and down. Of these, water reflections, I was more than thrilled. 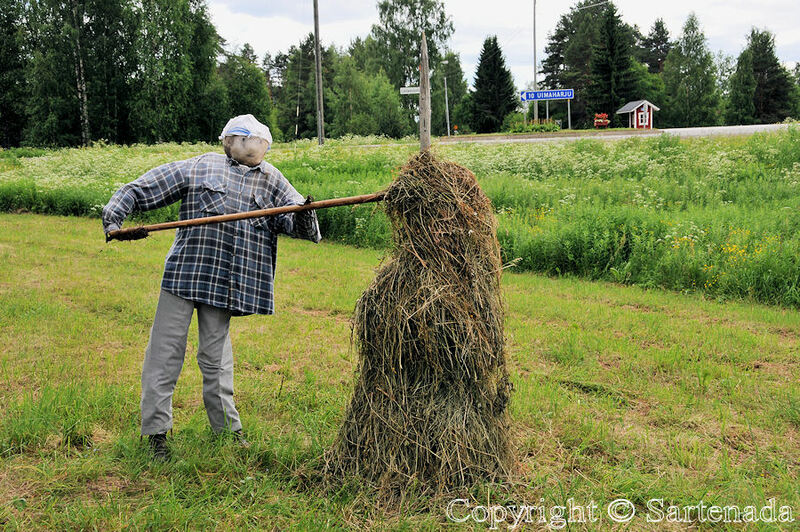 Oh, I forgot to mention that the scarecrows looked very funny to me. This idea is fantastic. I liked the swing very well. This can be seated easily swing back and forth, and let your soul dream. 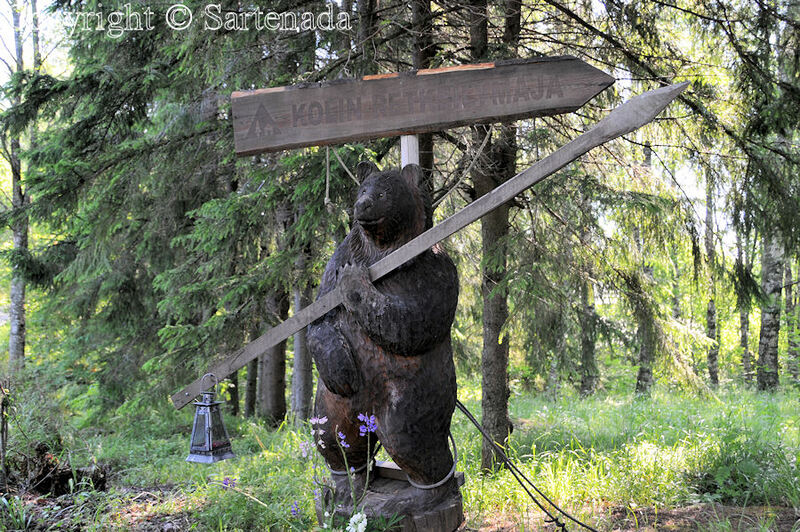 The carved wooden bear is a very nice conclusion, for your photo trip. I am very pleased that you share with us this beautiful place. I am grateful for this and look forward to the next pictures of you. All the best for you and Anja, on your daily routes. Thanks for all your nice comments. My e-mail follows today. Thank You commenting. There were few points in Your comment to which I want to make more clearings up. The style of that swing is traditional in my country. 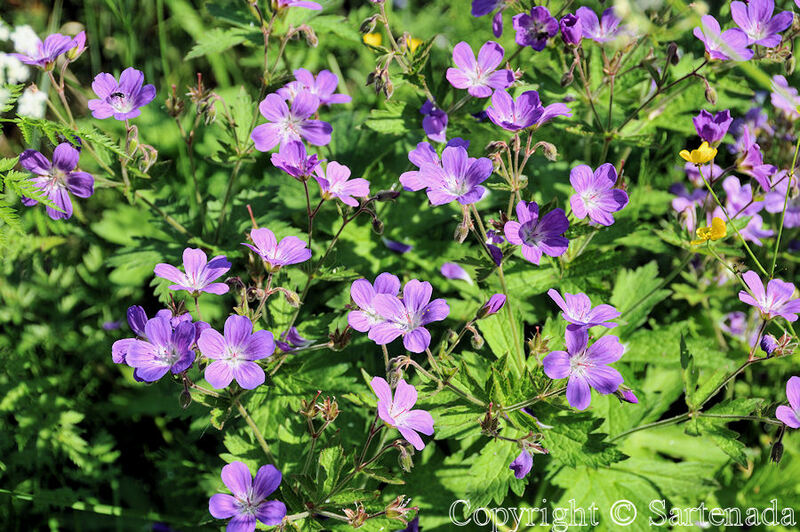 Generally it is found on countryside homes. Those figures are actually presenting our near history. First is presenting how to dry hay. That happened by putting hay on “July pole”. When hay was dry, then it was transported by horses to barn. 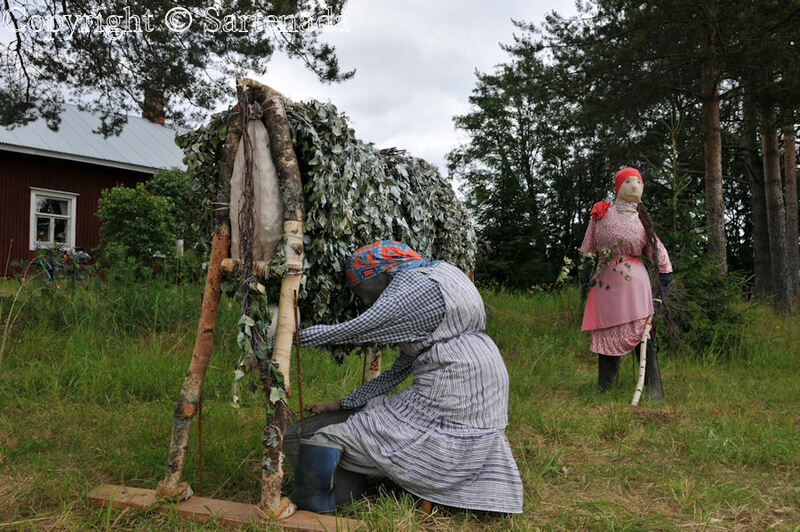 Second photo is showing how to milk a cow. In third all these are together. Fourth photo is showing, I guess, when “far-off American cousins” are on visit. These figures are great. So all these are presenting our history, but in humorous way. I have to say, that I liked them very much. Those two photos (5 & 6 from end) You mention are fantastic, sorry, if I say so too, because very seldom I have seen such kind of water reflection in waterline. About those flowers. 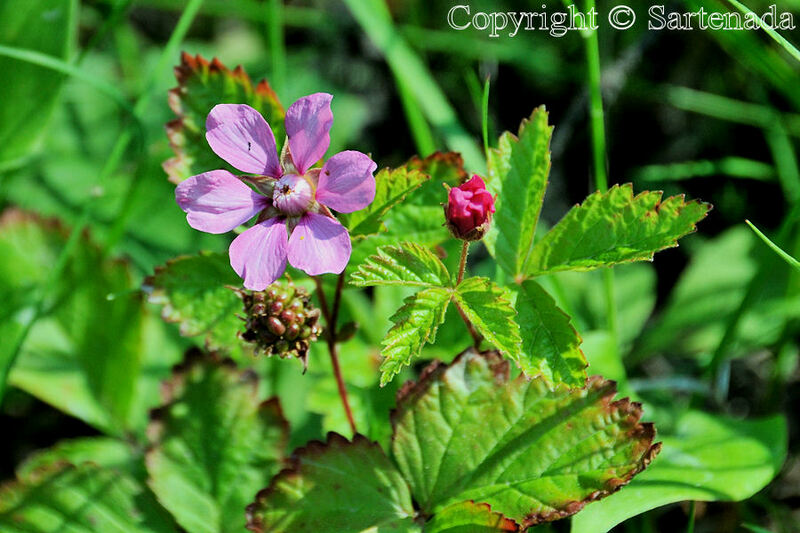 The first one is showing how arctic raspberry (Rubus arcticus) is in bloom. When I was young, I saw them a lot of them, but nowadays it is quite rare in nature. It is cultivated for commercial use. From it is made liqueur which tastes delicious. The last and second to last photos are breathtaking! What a nice cabin! Basic or not, I’d love it and the surrounding area is beautiful. What a wonderful way to be in nature! Did you two sit in that very nice swing? 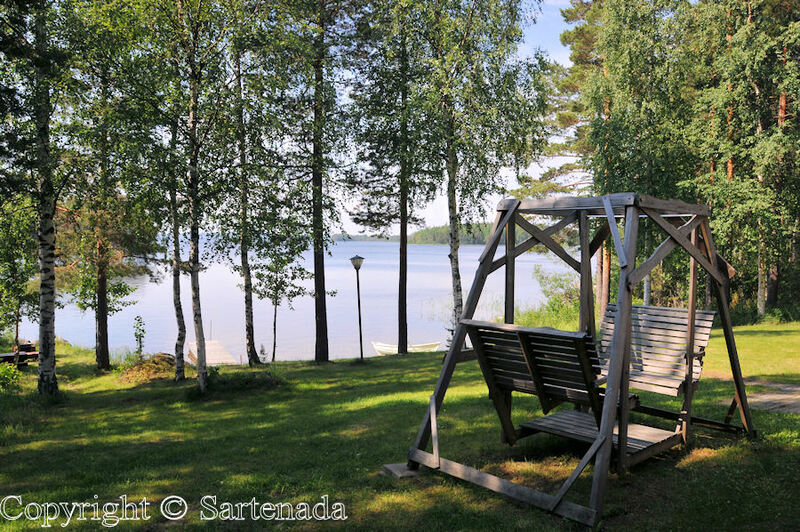 I could sit in that swing, drinking my coffee, and what the morning come awake. That is one place I could enjoy again and again to get away for the weekend. I enjoyed the series of photos telling a story. Yes, we were sitting in that swing many times. I have been fond of swings since my childhood. Here were we live, we have a swing for one perons only, but I can change place with my wife when she wants to swing. It was really nice read that You liked my “photographic story”. Qué paraíso y qué bellas fotos! Es increíble. Yo iría a ese lugar y no volvería jamás al mundo exterior!!!! Muchas gracias por tus palbras tan amables. Creo que tu país es El Paraiso. Quando volviere estoy mirando si ya tienes tu blog listo Si tienes problemas, puedes preguntarme. That has to be the clearest water I’ve ever seen. What a play the clouds and water had. Noticed your shinny blue Vectra in several of the shots. Not sure what shined brighter, the water or your Vectra. Impresionantes fotos de ese lugar lleno de encanto. ¡Que maravilla de paisajes! Tomo nota. 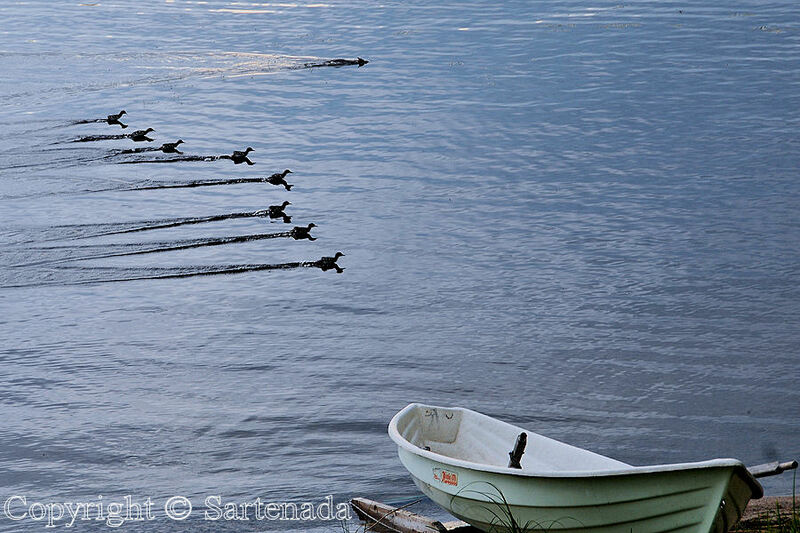 I especially like bird’s & boat photograph. Personally I like very much about those birds photos. 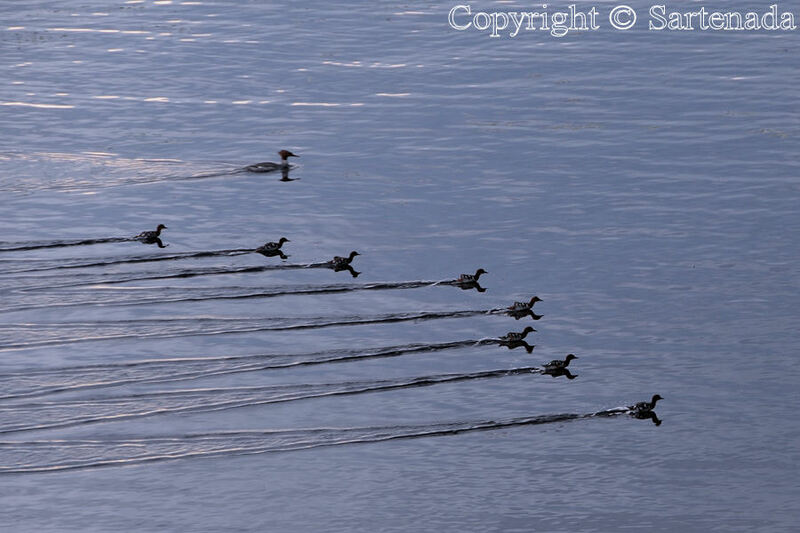 I have never seen how fast those birds can swim. It was incredible. When seeing tracks they left in the water, one can estimate it very well. ¡ Voy a probar en español y en francés! Tanta belleza en esta naturaleza, lejos del ruido y del mundo. Seré capaz de no volver más a mi casa…. Je garde ton blog y volveré a maravillarme con tus fotos. Est-ce que je me débrouille encore bien en espagnol ?? Merci pour ton commentaire si gentil. J’ai été très heureux que t’as écrite en espagnol ton commentaire. Comme tu l’a remarquée mon petit monde se differe des autres. Bonne journèe á toi aussi. tres belles photos, j’ai adorés les photos avec les épouventails et les photos avec le reflets dans l’eau (les nuages). Comment agréable à lire que t’as aimée mes photos de vacances. WOW! This looks so much like the state of Maine in the USA! Absolutely amazing! LOVED the photos of the still water with the clouds reflecting…!!!! Thank You for Your visit and nice comment. 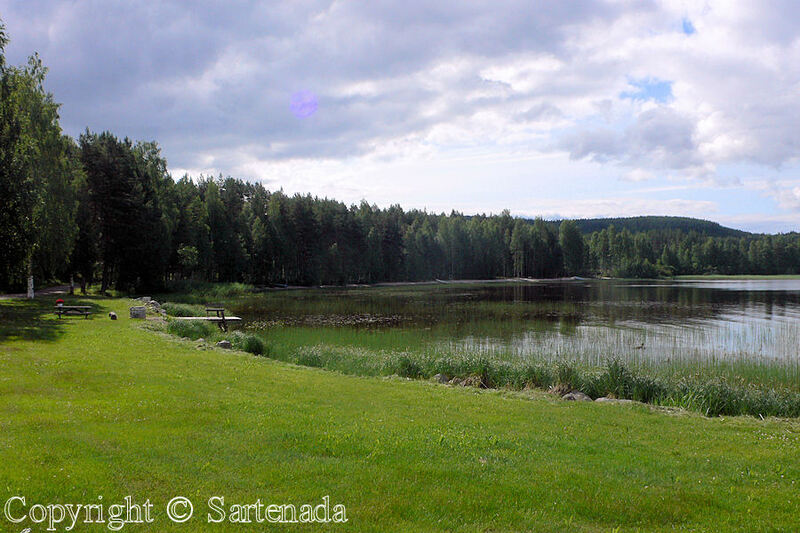 Is it not amazing when thinking that we can have same kind of landscape here in Finland and there in Maine! 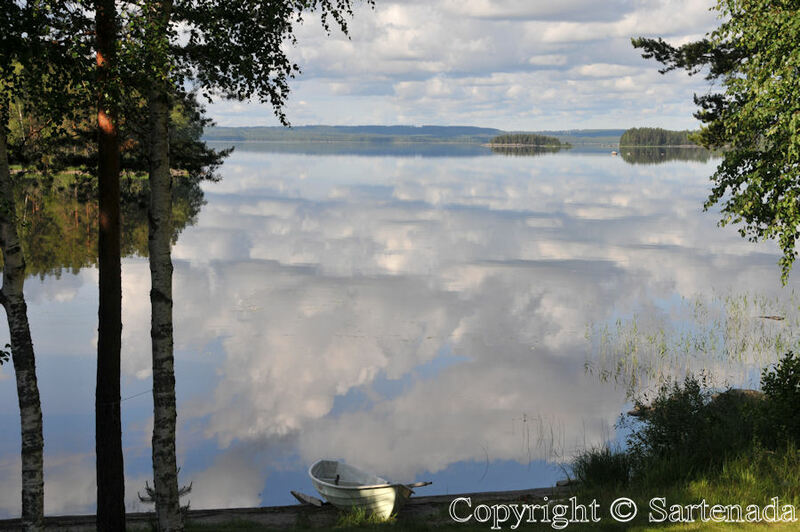 I love too those reflections of clouds in still water. 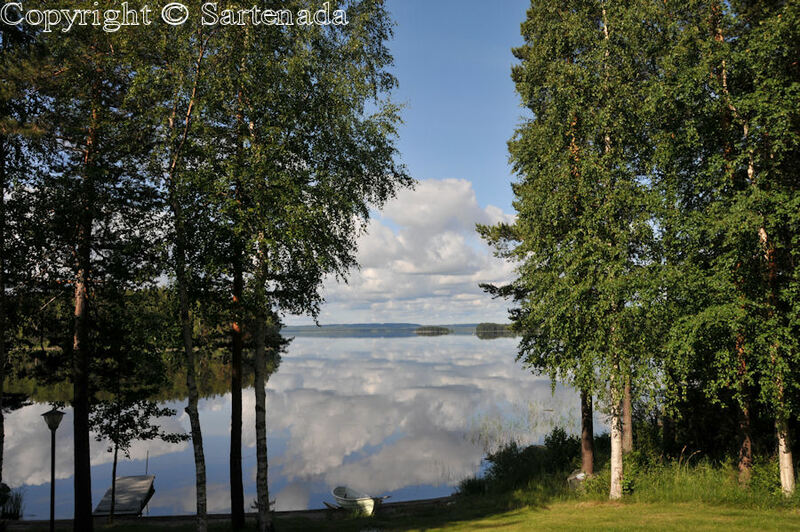 I was making breakfast and coffee, when my wife said to me, that come quickly to see how beautiful the lake can be at this moment. Thank You for commenting. I am very glad that You liked this place. It is really a very nice place where one can relax. Such a stunningly beautiful country! The place itself ideal for one week’s vacation and there was so much to see in surroundings also. I am glad that you left Your praising comment. Thank You. How beautiful. I think you’re right. This cottage sounds quite lovely and has everything you would need. What a lovely place to spend a week. We enjoyed us very much this cottage, although it was not a luxury one. The lake was big and it was great fun to visit towns and villages around it. Thank You commenting. I can easily imagine the peace and tranquility of this place. 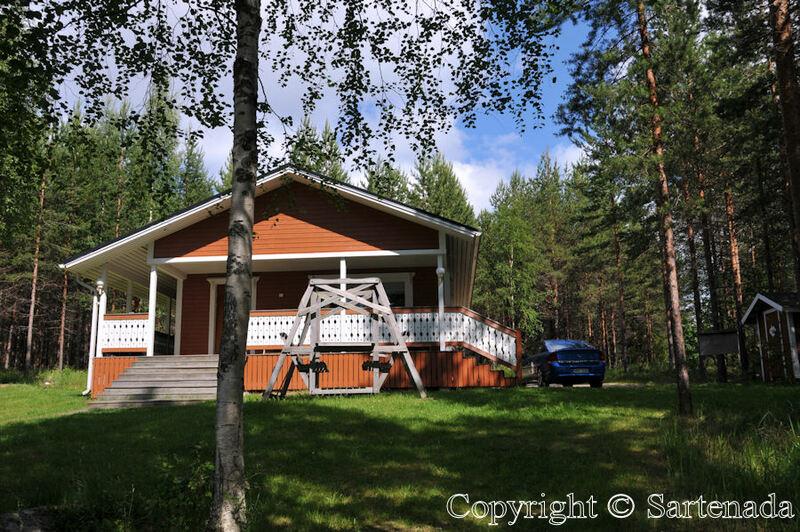 This cottage was a cheap one in the wilderness, but we loved it. Thank You commenting. 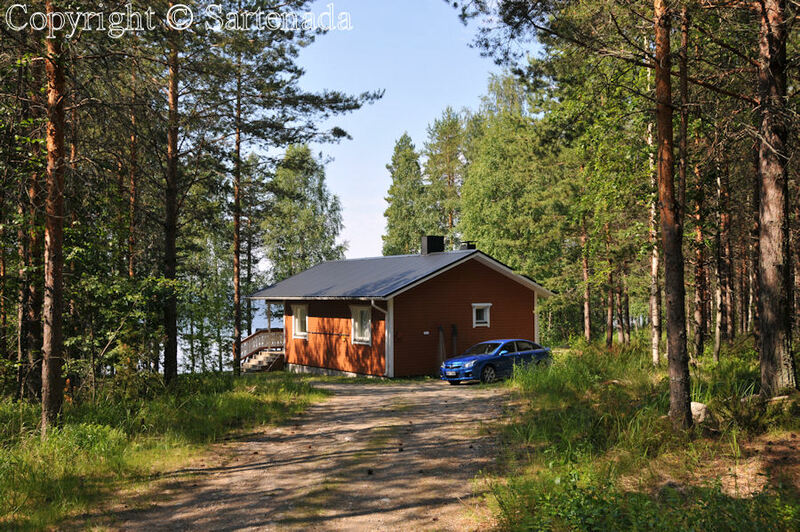 The cottage is not so small and is in a quiet place with a beautiful view of the lake and the woods. It must be wonderful to stay there. Thanks for sharing! 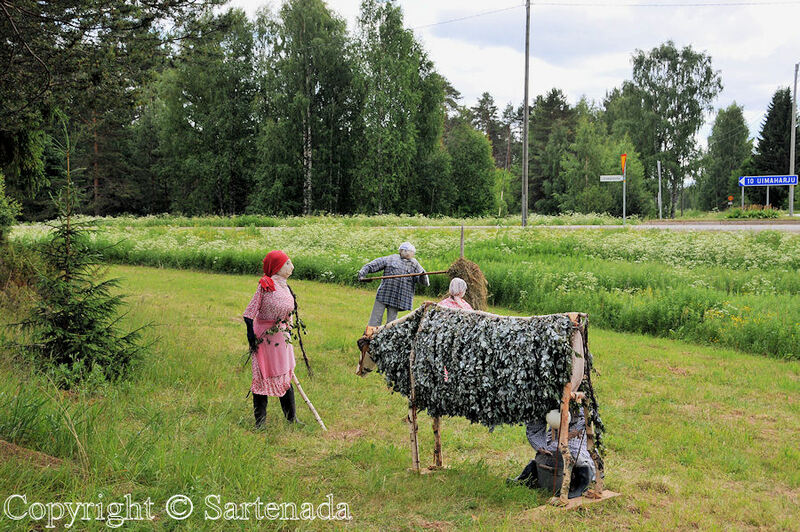 It is my friend living on countryside near to the town Varkaus. 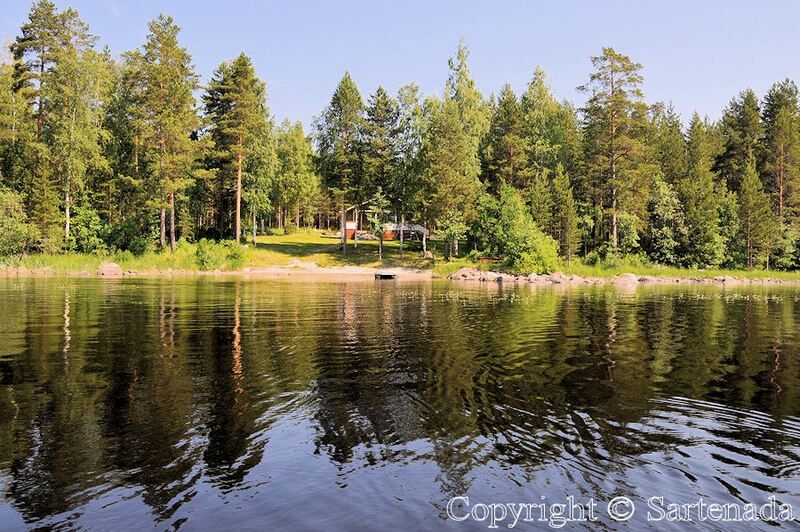 Next to his summer cottage is the cottage of Lady living in Holland.